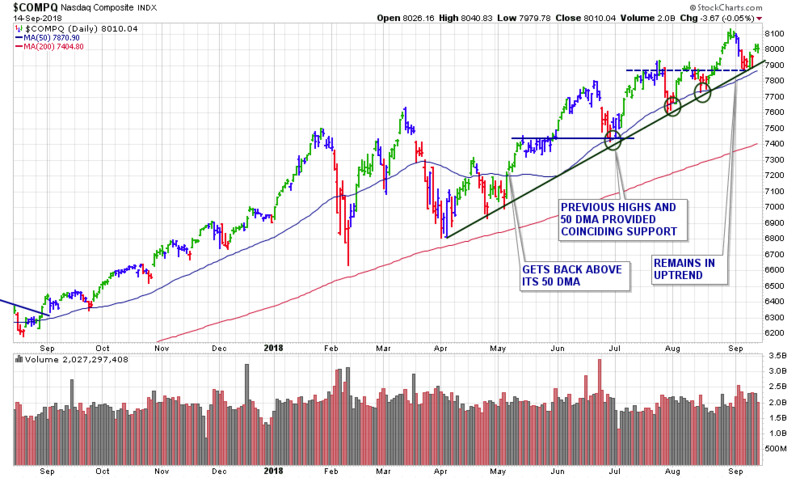 Last week all three major indexes posted solid weekly gains as each built on rallies from previous noted, well-defined support. For the week, the Dow rose +0.9%, while the Nasdaq gained+1.4%, and the S&P 500 added +1.2%. At current levels, the S&P is just -0.4% below its record close set in late August, while both the Dow and the Nasdaq are within -2% of their all-time highs. The Dow booked its fourth positive week of the past five. The recent gains have taken it to the highest level since late January. This week the blue chips briefly tagged seven-month highs early Friday and went on to close well above the 26,ooo mark, ending the week at 26,155. The S&P 500 gained actually less than a point on Friday, but that was enough for a fifth straight positive day, narrowly notching its longest win streak in about seven months. The S&P 500 ended its ninth positive week of the past 11. Also of note, small caps were the strongest performers Friday as the Russell 2000 ended with a daily gain of +0.5% and up +0.5% on the week. James will be making himself available this week (Sept. 17th – 22nd) to speak with you directly over the phone. He will be glad to answer any questions you may have. Get his insights on the current market environment, any particular stocks, the services he currently offers, and even his latest profitable venture into trading crypto-currencies. I ran my routine stock screens over the weekend and added 2 new stocks to our watch list. 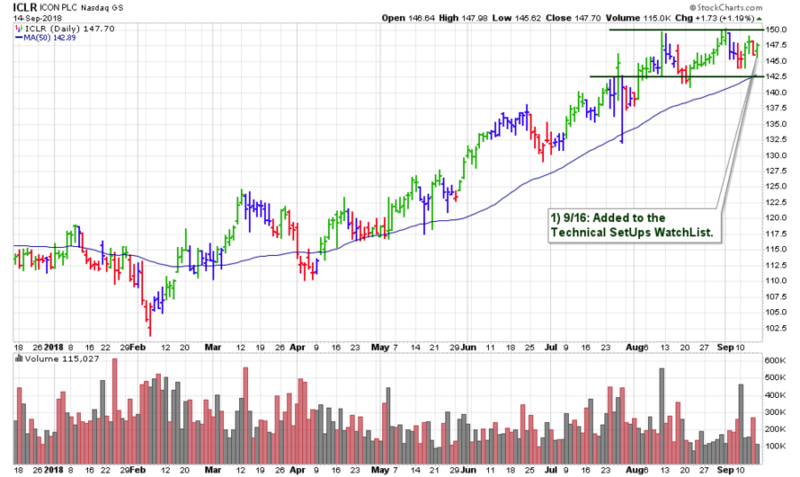 We now have 15 stocks which we will be watching for the next buyable breakout – see here. One stock in particular is ICLR which is building a base near new highs and above support of its 50-day moving average. This clinical researcher is highly ranked and a leader in its group.